The past few weeks have been kind to Malcolm Middleton, not that he'd have anyone know it. 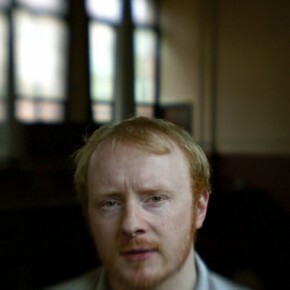 Buoyed by side-project Human Don't Be Angry's nomination for the prestigious Scottish Album of the Year prize, the one-time Arab Strap man has also seen his debut solo LP given a lavish vinyl reissue, with this latest warmly received UK tour expertly timed to coincide. A truly tremendous acoustic exhibition, this second leg at Newcastle's Cluny 2 proved precisely why he's hailed as such a cherished artist. In essence, the entire gig was summed up by "Angel and the Devil," the song which closes the aforementioned 5:14 Fluoxytine Seagull Alcohol John Nicotine, and did the same with tonight's set. A foul-mouthed hub of wallowing self-deprecation, its themes - along with the stripped, bare bones aesthetic - could be seen to epitomise not only the Falkirk guitarist's career, but also the country from which he hails. Far from conforming to stereotypes of Scottish miserablism, however, these songs mimic and almost mock such lazy preconceptions, each and every word laced with the wry, gallows humour that's rendered his work so beloved by many. As anticipated, 5:14... provided the primary focus, but this 90-minute appearance was hardly constrained to early material, with pretty much every nook of Middleton's catalogue receiving a look-in. Even with six albums to your name, 24 songs is a considerable undertaking; so the fact they contained nary a trough and barely a slip-up said much about the accomplished and consistent force he's become. Of course, the man himself wasn't having any of that, and even playfully encouraged his audience to visit the bar during old favourite "Best in Me," which in typically blunt fashion he dismissed as "seven minutes long, and shite." Save the inevitable laughter, though, no one moved a muscle, something which aptly reflected this captivating performance from a modest, softly spoken genius whose presence was a pleasure to share the room with.